Incredible. What a way to cap off his presidency. Upon inauguration, all presidents are challenged by the White House executive chef to conquer the 5 pounds of ground beef featuring 20 slices of Monterey Jack cheese, avocado, and a pound of fries on the side. And on top of all that, it has to be done in under an hour with no bathroom breaks nor any help from the vice president or first lady. Success means a free T-shirt, comped bill, and a plaque on the wall of the Oval Office, but considering the sheer amount of angus beef one has to conquer, success is far from a given. At first it seemed as if Obama might fall before “The Monster,” as he could only finish half the burger before he hit a wall. But POTUS kept fighting and in the end devoured the whole thing in just 51 minutes, two shy of John Quincy Adams’ record time set back in 1826. Barack became only the ninth president ever and first African-American to—as the T-shirt puts it—“Defeat The Meat,” ensuring himself a place in American history that will not soon be forgotten. But where Obama triumphed, most others have failed, as the mountain of beef has vanquished a whopping 80 percent of previous challengers such as Thomas Jefferson, Woodrow Wilson, and Harry Truman, who was disqualified for throwing up in the Rose Garden just seven minutes into the challenge. Even the late, great JFK fell short, although his wife Jackie did complete the challenge in John’s honor shortly after his assassination. Wow, talk about going out strong. 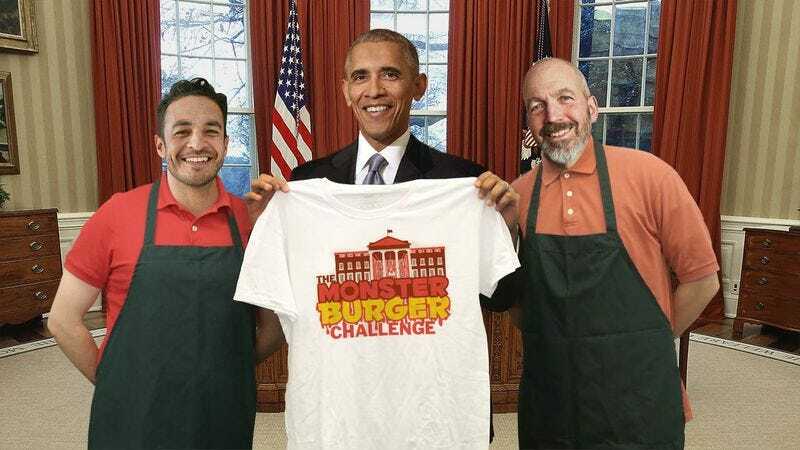 No matter how you feel about his policies, you have to admit Obama did the highest office in the land proud by totally dominating the 2,650 calories of pure, grade-A burger. Way to go, Barack!